$100 Gift Certificate Winner for September! 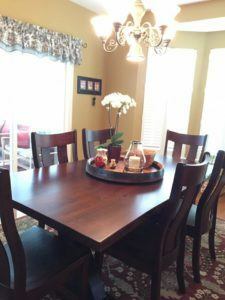 This month’s $100 winner is Christine Coughlin, who was kind enough to post a beautiful picture of her new dining set on Facebook this month. She writes, “Loving my new cherry table with live edge and chairs! Awesome job Amish Originals and excellent customer service and delivery!” Christine, your new furniture looks wonderful! Thanks for sharing a picture—we’re thrilled that you’re happy with the finished products!